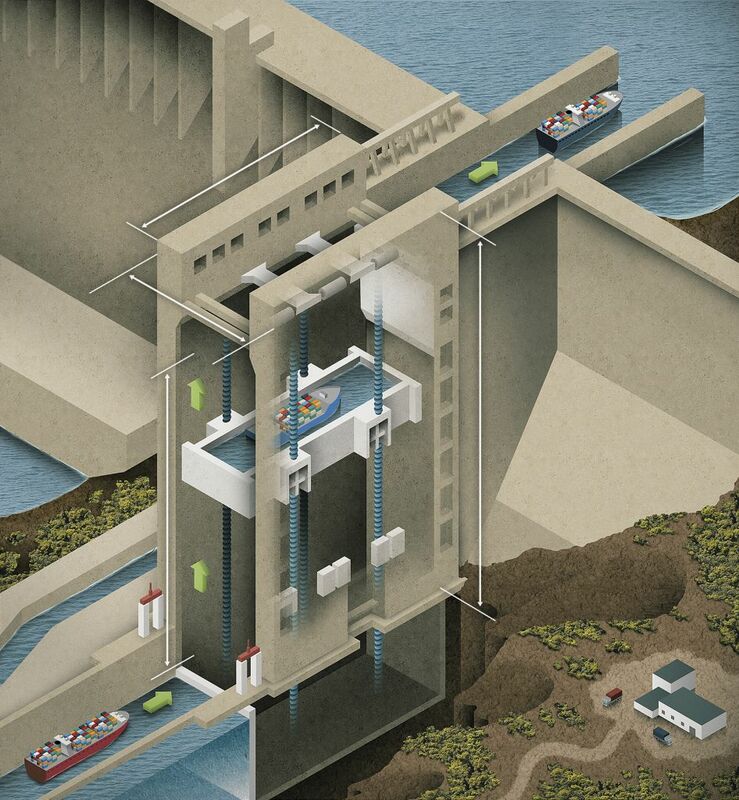 To anyone who sees it for the first time, the Three Gorges ship lift is more like a building than a device. It has a maximum lifting height of 113 metres, enabling 3,000-tonne ships through. Its caisson and related facilities weigh about 15,500 tonnes, making it the largest and most complex ship lift in the world. Securing the safety of ships passing through the lift is crucial, Yu explains, and lifting such a heavy caisson to such a height requires precision balance. The Three Gorges ship lift has a counterweight system to balance the weight of the caisson, and a gear-and-rack system to drive the chamber up and down. The 15,500-tonne counterweight, the equivalent of a fully loaded caisson, is divided into 16 sets, evenly located in the twin towers at the sides of the caisson. The counterweight is connected to the caisson by 256 ropes via 128 double-rope pulleys at the top of the towers. These make sure that the caisson and the counterweight are in balance, no matter the position of the caisson. Four toothed racks are installed in the towers at each of the two sides of the caisson, from the bottom to the top. The caisson is driven up and down by four pinions that engage with these toothed racks. Each pinion is driven by two electric motors. All drives are interconnected via synchronizing shafts under the caisson. Thanks to the counterweight system, the pinions and toothed racks only carry about 400 tonnes of total weight instead of 15,500 tonnes, greatly improving efficiency and reducing energy costs. After careful consideration and comparison of alternatives, CISPDR chose SKF spherical roller bearings and thrust bearings to be used for the ship lift’s counterweight system, driving system and safety mechanism. 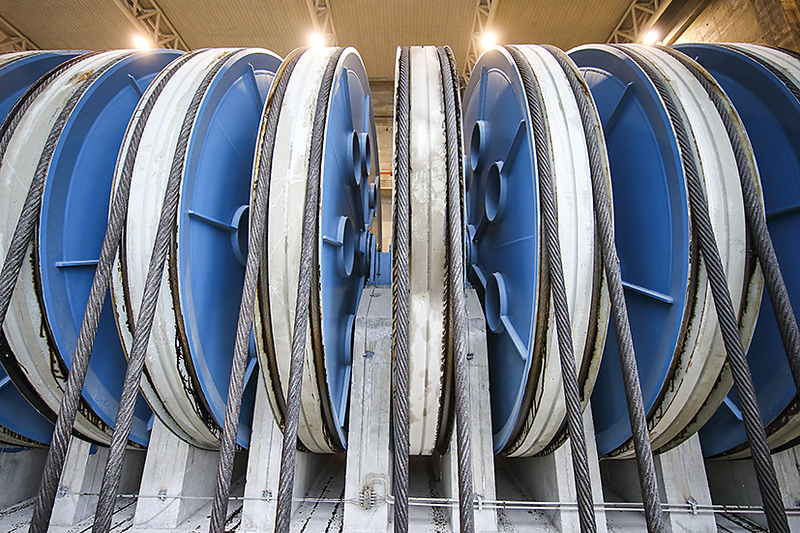 They also used SKF spherical plain bearings for the caissons hydraulic cylinders and tightrope locking system to make sure the lift system operates safely and reliably. SKF also supplied hydraulic nuts and hydraulic pumps, as well as other mounting and dismounting tools, to increase the maintenance efficiency. CISPDR has had considerable technical cooperation and exchanges with SKF since the early stages of the Three Gorges ship lift project, and the company recognizes the high quality of SKF products and service. Freddy Pan, SKF hydropower segment manager, explains that China Three Gorges Corp. is a key customer and that SKF has been providing technical consultation and on-site services for the operations and maintenance of the Three Gorges ship locks since 2012. At the same time, SKF provides heavy-load grease with excellent water resistance, a property that matches the SKF Explorer bearings, to extend the maintenance interval significantly.